On behalf of everyone here at NorthernEmbassy.com, Happy Canada day! We are truly fortunate to live in this amazing country and in one of the best BMX scenes in the world. For this week only, email your full name and address to NorthernEmbassy@gmail.com and we’ll hook up some of our limited edition Canada stickers. 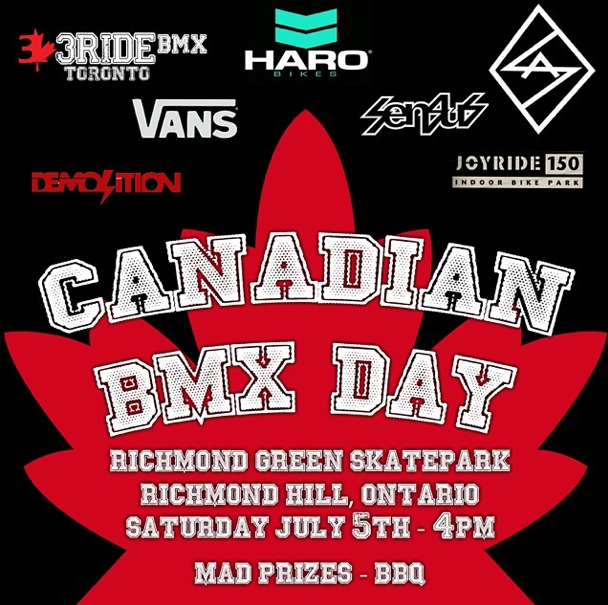 Also, if you’re anywhere near Toronto this weekend be sure to come out to the Canadian BMX Day at the Richmond Hill park on Saturday, info above. We will be on hand to film the event, check back for the edit shortly after. We have some good things in the works right now at NE so check back soon for more on that.